Review Context: I am generally interested in simulator games, but it isn’t my most favorite and played genre. The most recent simulator type game I’ve played is Out of the Park Baseball ’18. 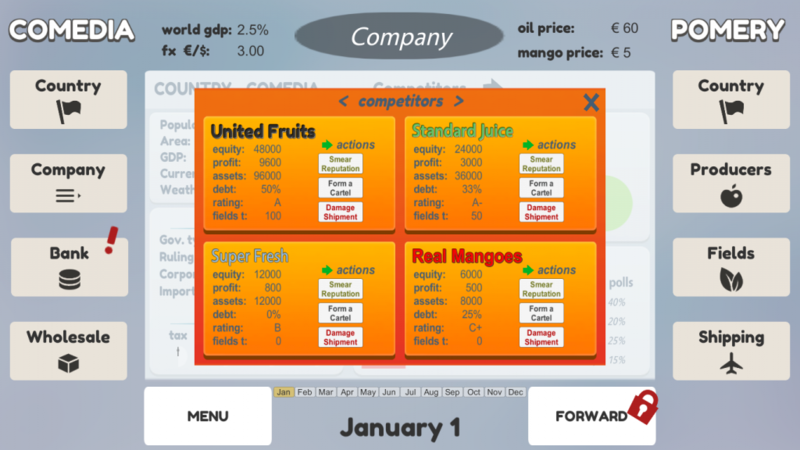 Mango Cart, developed by AkriGames, is a game that caught my interest just due to the subject matter, trading mangos. This is a very unique game with elements that made me want to play it, although the fact that it’s a essentially a spreadsheet game intimidated me. Still, Mango Cart‘s interesting concept of trading mangos between two countries was enough for me to want to dive right in. When you start Mango Cart you can name your company, allowing your own personal touch. When the game loads you are met with a main screen, which consists of a main window in the middle, with four widget button options on each side, similar to how a website with 2 sidebars would look like. Within the middle window it contains all the numbers and information you need to know, including arrows that lead to pop-up windows with more information and financial decisions. The disappointing part about Mango Cart is that it doesn’t have an in-game tutorial, as you are left to tinker around to figure out how to get your game moving. There is a calendar system, which is essentially how this game moves forward for doing various events, starting in the month of January. There is a lot of information to take in when playing Mango Cart, almost too much information, especially initially. Figuring out what to do and where to click next is a mental chore, although there are red icons to sort of point you in the right direction. The premise of Mango Cart is you trade mangos either through buying and reselling, or purchasing your own mango fields in the made up country Comedia. The cyclical nature of the gameplay is something you have to find out yourself because there is no tutorial, a criminal omission for a game like this, but essentially you have to keep hitting “Forward” next to the calendar to keep the game moving along the calendar of events. The process is essentially pick a choice of bank, mango acquisition, shipping, then re-sell wholesale, with the ability to obtain bank loans if need be. All of these events take time on the calendar and by the end of it the full year is finished. You will quickly realize that this just isn’t a game about trading mangos, but a competitive game against other mango companies and a game about politics. 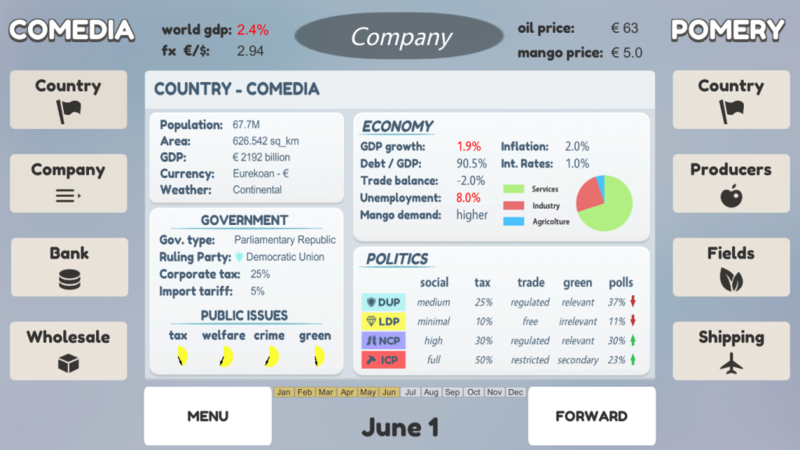 Much of the game revolve around managing finances, as you will have to pay attention to tariffs and which political party is in power. There is an election each year that you can actually play a role in, as you have the ability to make political donations. When the calendar advances random events can also occur, like a shipment of your mangos getting damaged, more government regulation through tariffs, and even events concerning your credit rating with your bank. Unfortunately when I played there was only one political party mostly in power, with the same tariff event occurring every time. I did find that the more I played, the events seemed to vary a bit. This is an extremely mathematically intensive game using plenty of finances that I certainly wasn’t prepared for, but luckily you can choose what to pay attention to and still find enjoyment. Losing is extremely easy in the game, as once your cash reaches zero you automatically lose, which happened to me countless times, mostly in the beginning when I had no clue what I was doing. 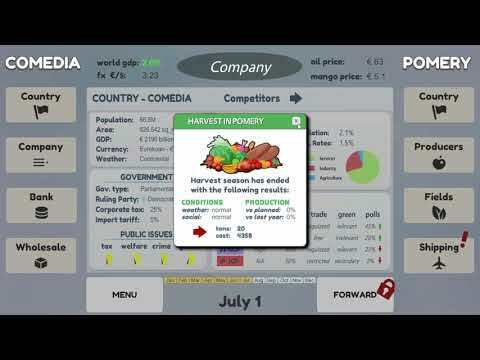 That being said, this is an easy game to jump in and out of, with a lot of customization of how you want to manage your mango company. For all of the faults in Mango Cart, I do appreciate the many choices a player can make when constructing their mango company and competing with other companies. When purchasing mangos for reselling there are different qualities of mangos for reselling and they all have a different impact on how your business will be perceived or be able to sell wholesale. You also have different abilities that can affect your competition, like smearing their reputation, forming a cartel, and damaging their shipments. This helps to add plenty replay value, as I haven’t tried all the options yet. From a technical standpoint, Mango Cart is very simple, with a user interface that is simple but confusing and overwhelming in its layout. Unfortunately, I did encounter bugs with windows floating to the top, hard to click windows, and sometimes general confusion within the bank loans window of when something was toggled or not. There is no soundtrack to the game, which is a good choice because it isn’t needed. Mango Cart is a mixed experience, as a game that you will need to dedicate a lot of time to learn the mechanics on your own. Although a confusing game, there’s still a lot to be respected about the game, as I see this as a work in progress to make the player experience less confusing and more accessible to new players with a better user interface. I do applaud AkriGames for creating a unique passionate mango trading experience that I know I will play more of in the future, but a game I will be very cautious to recommend at this time.